ST. LUCIE COUNTY, Fla. — The snowbirds are coming, and nature watchers have a message. They're reminding our temporary residents to be careful when interacting with the real snowbirds that are flying here on their own. The sights and sounds of South Florida are what bring snowbirds here, both humans and actual birds. "So when the snowbirds come down, the snowbirds come down," said Ken Gioeli, a Natural Resources Extension Agent with St. Lucie County and the University of Florida. He's reminding people to be careful when interacting with their aviary namesakes, especially when it's cooler. "Nature needs to take its course," said Gioeli. "When they dive down and catch the bait as people are fishing, they'll dive down five or six feet," said Alfred Clark, a visitor taking in the sights of the Northern Gannet. Right now, there are reports of people finding Northern Gannets on the beach where they appear to be in trouble. "They get exhausted sometimes and if there's a shore nearby, they will land on shore," said Gioeli. "If it's cold out, they have to wait until they warm up. When they warm up, they turn into the wind and begin flapping their wings so it looks a little distressed." 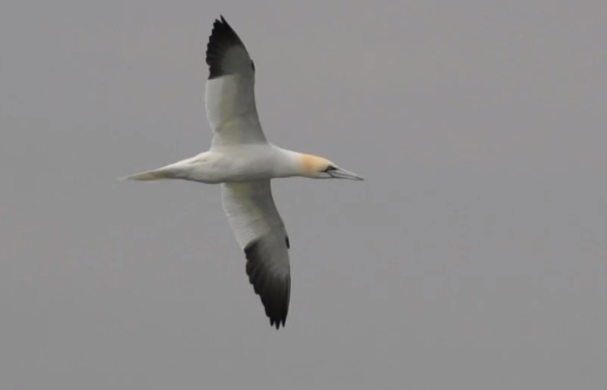 Gioeli said human interaction often puts more stress on the bird, and it's not just Gannets. "I've seen pelicans on the chilly side and tired and they let people get close to them," Gioeli said. "With any of these birds, just leave them alone." If you do see a bird visibly in distressed, experts said the best advice is to call the Florida Fish and Wildlife Conservation Commission.